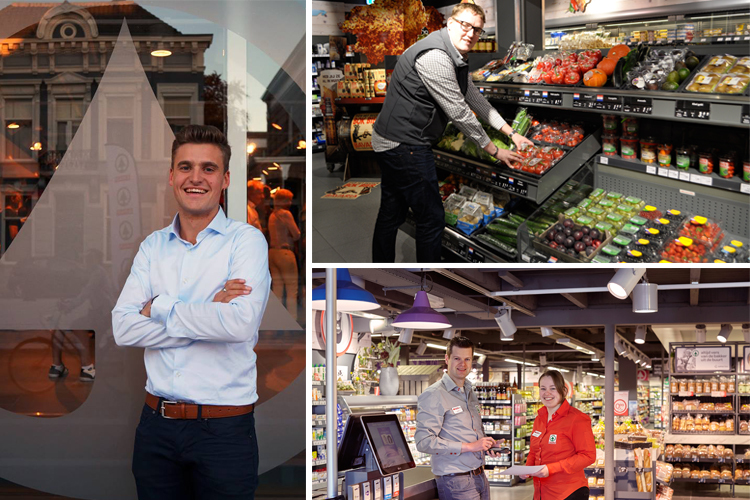 In addition to expanding its portfolio of SPAR Express stores at filling stations throughout the country, SPAR Netherlands has been rolling out its next generation neighbourhood store format, whilst growing its SPAR city network nationwide. We interviewed three independent retailers – two SPAR city store owners and one neighbourhood store owner – to reflect on the changing retail market. Young independent SPAR retailer, Djordy de Nooijer, opened his first SPAR store two years ago at just 23 years of age. He knew early on that he wanted to run his own business – entrepreneurship, he says, is in his blood. Djordy runs a 406m2 SPAR city store in Breda, in the south of the country. Mathijs Faassen has been working in the supermarket world for 18 years and opened his first SPAR store just over a year ago. His is a SPAR city store located in the centre of Leeuwarden, the 2018 European Capital of Culture. Especially popular in his store are the freshly prepared sandwiches, which bring in substantial lunch-time traffic. Entrepreneurial couple, Johan and Saron van Leijenhorst, have a combined 28 years of experience in the retail industry and have been operating their 459m2 SPAR neighbourhood store in Otterlo for nearly two years. The focus of the store is on fresh and the departments have been organised according to consumption moments, with breakfast products close to the entrance and lunch and dinner items further on in the store. This feature was first published in Issue 4 2018 of our quarterly magazine, Contact International. To read more stories from this edition, follow this link.